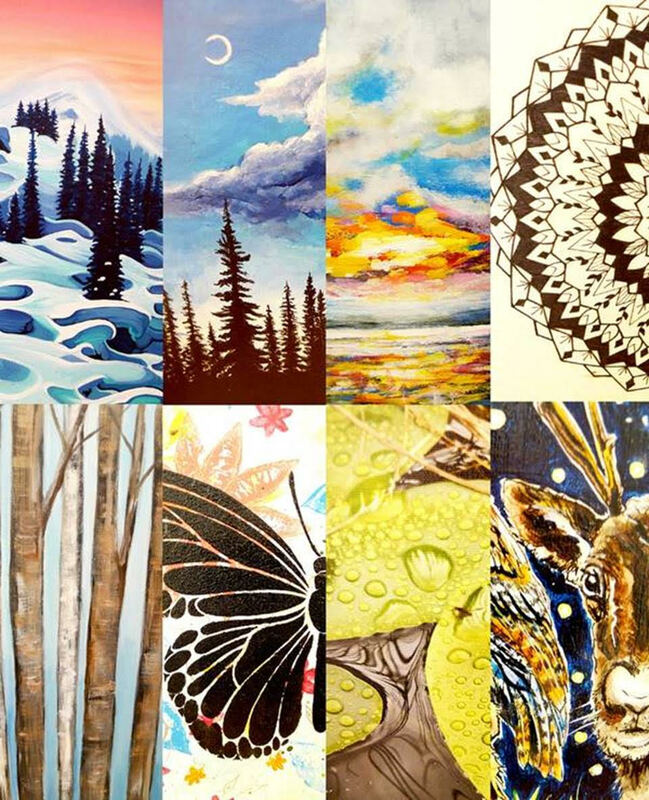 Friday February 1, 2019 – Revelstoke, BC – “Anything Goes” is around the corner and set to launch for Friday February 8th from 7-9pm. This annual event is a fundraiser for the Revelstoke Visual Arts Centre and features amazing work donated by local artists. Artists have created 12” x 12” pieces in their own style, medium and theme (hence the name: “Anything Goes”) in support of the Centre which this year’s proceeds will go to the planned and much needed repairs and renovations of the facility including a new roof and heating/boiler system. “We have had an amazing turnout for entries to this very important event this year and it truly thrills me to see the enthusiasm and care our artists give towards supporting the Centre! I can’t wait for the response to all the amazing work that has been submitted and see the passion of our community come through in supporting this great cause. ” says Sarah Windsor, RVAS Executive Director. Participating artists set the starting bid of their work and choose to donate a portion or the full amount received from the highest bidder. One piece of work will be selected by the Exhibition Committee as ‘Best in Show’ and live auctioned off during the event. Tickets are $15 and include admission, door prize entry, refreshments and nibbles catered this year by La Baguette. Visitors are advised to come early as bidding will close in intervals starting as early as 7:30pm and work will go fast. The Revelstoke Visual Arts Society invites the community out for a fun night celebrating the visual arts and our local artists. Tickets are also available at the door on event night but dependent on occupancy so advance purchase is recommended. The Revelstoke Visual Arts Society is a registered charity and exists to exhibit, educate, interpret, preserve, and foster the visual artistic and cultural heritage of the city, the region, the province and the nation. The Society is grateful for the financial assistance and support from BC Gaming, Columbia Basin Trust, Revelstoke Credit Union, Revelstoke Community Foundation, and the City of Revelstoke. A sneak peak of some of the art that will be available at the Anything Goes silent auction at the Revelstoke Visual Arts Centre.